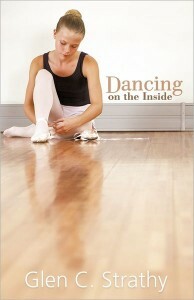 Dancing on the Inside is a great young adult read. Moving to a new town, Jenny doesn't know anyone. After watching Swan Lake on DVD over and over, Jenny convinces her parents to sign her up for ballet classes. But when Jenny arrives, she's shy and hides under the piano watching the other girls. She goes home and practices what she's watched privately. Then Jenny strikes up a friendship with Ara, a girl loves to dance but always takes backseat to her sister. Jenny thinks Ara dances beautifully and they decide to help one another; Ara with her steps and Jenny with her fear of others watching her dance. Jenny find she has a real knack for choreography and works on a dance to help Ara shine. But, Ara is determined that Jenny will dance alongside her. Will Jenny get over her fear or will she always remain on the sidelines watching her dream dance away? Strathy does a great job of character development - keeping the characters believable. The atmosphere of the dance studio is one I have never experienced, but it's brought to life admirably. A great read for any child wanting to pursue their passions but are afraid they aren't good enough. I confess I started writing stories when I was 11 years old and too shy to have a life. Back then, I mostly read science fiction and comic books and those were the kind of stories I came up with. Probably one of the most profound experiences I had as a kid was a summer arts camp run out of a local church basement. We were encouraged to express ourselves freely, and it was just what I needed. As I got older, I found similar experiences taking drama lessons. I started acting in community theatre and met a lot of local writers, actors, dancers, and artists. I believe the best thing about performing arts (and other arts too) is that they give people more freedom to be who they want to be. After spending time as a student, actor, teacher, and freelance writer, I started writing fiction again when the idea for Dancing on the Inside came to me and wouldn't let go. After thinking about and planning the book for a couple of years, I wrote the first draft as part of National Novel Writing Month and spent the following months revising. For those interested in such things, I earned an M.A. in English from the University of Western Ontario, and graduated from the Artist in Community Education program at Queen's University, Kingston. I have also co-authored two non-fiction books and am a member of the Professional Writers Association of Canada (PWAC). I live with my wife, fellow writer Kaitlin Rainey, and our daughter in Kingston, Ontario, Canada.